This year, Chanukah, the Jewish feast of lights began on the evening of 1st December or the 24th of the Hebrew month of Kislev. Chanukah means dedication, consecration or inauguration and celebrates the reconsecration of Holy Temple in Jerusalem in the second century BCE. The Temple was reclaimed after the defeat of the Seleucid Empire by the Maccabees, a Jewish rebel force that retook Judea from the occupying forces of King Antiochus Epiphanes who had pillaged and defiled the temple during a Hellenizing campaign that effectively banned the Jewish religion and its practices. Upon his defeat, legend has it, there was only sufficient sanctified olive oil found in the temple grounds to fuel the eternal flame for a single day but, miraculously, that small quantity burned for 8 days giving the people time to press and sanctify fresh supplies of oil. The month of Kislev falls at the height of the olive harvest and therefore, olive oil and fried foods are enjoyed during the eight day Chanukah celebrations. Traditionally, oil lamps containing 8 wells with wicks, plus an extra one serving as the shamash or lighting assistant were lit and placed at the entrance to houses or their front windows to proclaim the victory and survival of the Jewish religion. 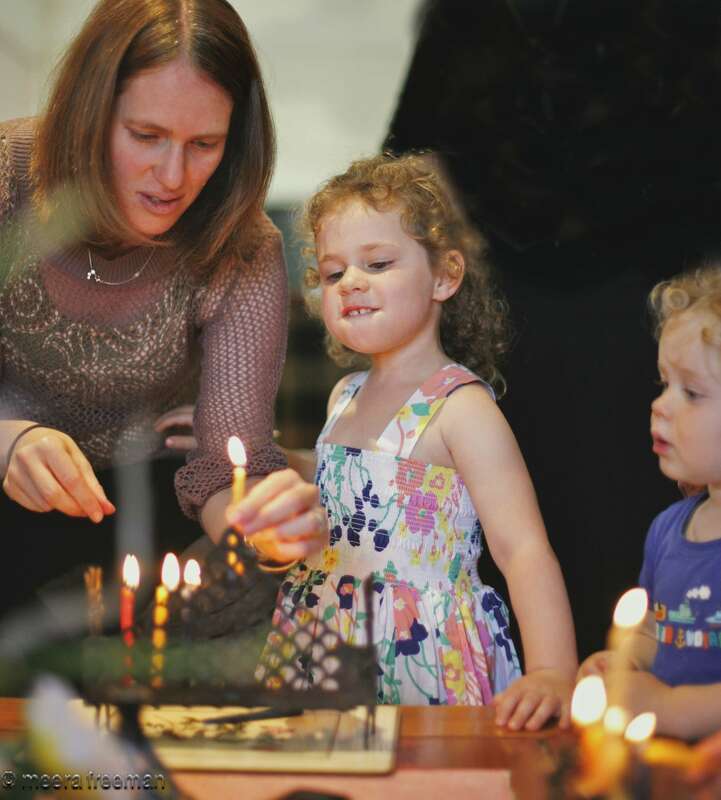 Each night, the shamash taper is used to light an increasing number of lights commencing with a single light and ending on the last night with all eight lights burning brightly. These days, eight branched chanukiot or candle holders are more common and households often have a chanukiah for each member of the family. Kindergarten and school children are given Chanukah projects to make their own candle holders from found objects such as bottle tops and strips of wood. Chanukah is a joyous festival with gifts, usually of gold coins (these days gold paper covered chocolate coins are also popular), special songs, games and delicious fried foods. 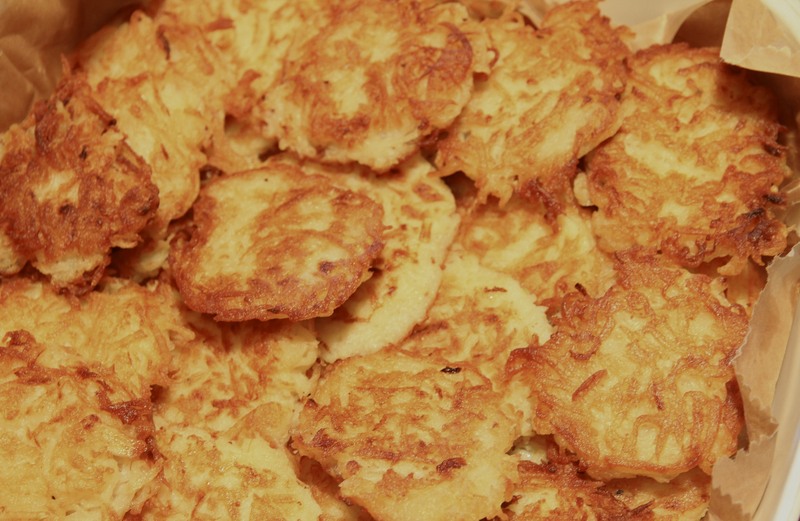 Donuts and fritters are common to all Jewish communities while potato latkes or pancakes are an Eastern European tradition. Using the coarse grating blade in your food processor, grate the potatoes and onion and transfer to a bowl. Beat the eggs and stir into the potato and onion mix, adding the flour, baking powder, salt and pepper. Set aside to rest for 5 to 10 minutes, spooning off any water that is exuded from the potatoes and that will rise to the top. Heat 2cm of the oil in a heavy frying pan and drop in spoonfuls of the mixture, frying till golden brown on each side. Drain on a rack. If making the latkes in advance, they may be reheated in a hot oven.